Bulgaria’s Black Sea city of Burgas will target local and foreign tourists with three major archaeological attractions in summer 2015: the newly found lead reliquary with ashes from the grave of John the Apostle in Ephesus; the ancient and medieval port and fortress of Burgos (Poros) on Cape Foros where the reliquary was found; and the ancient and medieval Aquae Calidae – Thermpolis Archaeological Preserve. “The cliché about the young fishing and “proletarian" city of Burgas is rapidly and completely justifiably becoming obsolete," Burgas Municipality says in a statement referring to the perception established in Bulgaria during the communist period (1944/48-1989) that that was when Burgas emerged as a major city, largely thanks to the migration of working class families. Instead, the Municipality points out that the recent and not so recent archaeological discoveries have proven the long history of Burgas as a major urban center. 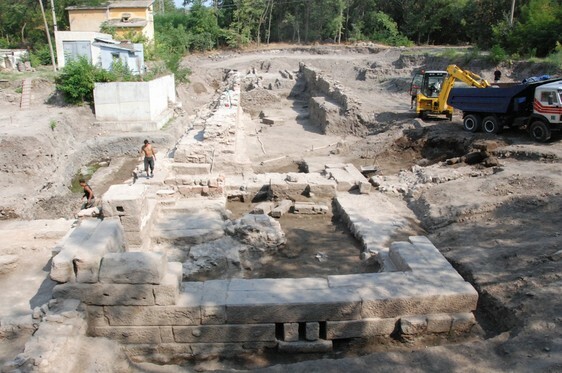 “The active work of the archaeologists in recent years supported by Burgas Municipality has brought to the surface, literally and figuratively speaking, irrefutable evidence for ancient civilization traditions. It turns out that the geographical location of the city between the East and the West has been and will be an engine for its demographic, economic, and cultural development," notes Burgas Municipality. It also announces in its statement that the lead tube reliquary containing ashes from the grave of John the Apostle known in Bulgarian (Eastern) Orthodox Christianity as St. John the Apostle, which was discovered during the 2014 excavations of the ancient and medieval port and fortress of Burgos (Poros) on Cape Foros but was made public in March 2015, will be exhibited by the Burgas Regional History Museum starting May 18, 2015. The municipal authorities point out that the two other archaeological attractions that will seek to interest local and international travelers are the ruins of the Burgos (Poros) Fortress itself, and the other ancient and medieval city on the territory of today’s Burgas – the ancient spa center of Aquae Calidae known in the Middle Ages as Thermopolis, which is presently being restored. In addition to its account about the exhibition of the John the Apostle reliquary, Burgas Municipality explains that Cape Foros on the Black Sea coast used to have a large Ancient Roman settlement and port as early as the 3rd century AD, even before the construction of the fortress wall of Burgos (Poros). The excavations have revealed a number of Roman artifacts at Burgos (Poros) including coins, pottery, parts of bronze and marble statues, and a large 3rd century AD Roman villa. The Roman villa in question is said to have been a luxury property with hypocaust (an Ancient Roman system of underfloor heating), marble tiles and marble window frames. It was covered with a fine plaster colored in a particular nuance of red known as “Pompeian red", not unlike the rich buildings painted the same way in the Ancient Roman city of Pompeii in Italy. Later, in the 6th century AD, the fortress wall of Burgos (Poros) was built; it measured 285 meters in length, 2.9 meters in width, and had 4 rectangular towers. This is when the port complex of Poros was built, too; it consisted of many storage, residential, and administrative buildings. The Bulgarian archaeologists have discovered a 6th century Early Christian basilica with three naves and one apse whose floor was tiled with large ceramic slabs. The Burgos (Poros) Fortress has also yielded numerous Late Antiquity (4th-6th century AD) archaeological finds such as gold and bronze coins, a very rare lead seal from the early 7th century AD, intact ceramic vessels, a marble column, clay lamps, among others. In March 2015, the Burgas Museum also announced another interesting Late Antiquity find from Burgos – a 6th century latrine (toilet). In the 13th-14th century Poros was mentioned in written sources, and was marked on almost all known medieval maps from the 14th until the 18th century. In addition to Burgos (Poros), the other ancient and medieval city located on the territory of today’s Burgas is the ancient spa resort Aquae Calidae (meaning “hot waters" in Latin) known in the Middle Ages as Therma or Thermopolis (meaning “warm city" in Greek). Burgas Municipality points out that at the present moment the archaeological monument looks like a construction site because of the project for its restoration and rehabilitation, and the construction of tourist infrastructure. However, the entire Aquae Calidae – Thermopolis Preserve is expected to be ready to welcome its first visitors in summer 2015. The Municipality notes that one of the archaeological components found at Aquae Calidae – the bath of Ottoman Turkish Sultan Suleiman I the Magnificent (r. 1520-1566) used by him in 1562 – has already been fully restored. It was built in the center of the Ancient Roman thermae (public baths) of Aquae Calidae. It is a rectangular structure with a marble pool in the center which collected hot mineral water for treatment purposes, with numerous washing basins on the walls. According to the travelogue of Ottoman Turkish chronicler Evliya Celebi, Sultan Suleiman I found cure in the healing mineral waters of Aquae Calidea – Thermopolis. In a show of gratitude he built a new bath there and founded an annual fair that led to economic development in the region. The sultan’s bath has been renovated with the restoration of the marble tiling of the walls and the pool, and the Ottoman Turkish murals in their typical 15th-16th style. The tourist infrastructure at the Aquae Calidae – Thermopolis Archaeological Preserve – such as a visitor center, a child care center, a cafeteria, and an exhibition, and a information billboards – is still under construction. The ancient and medieval fortress and port of Burgos (Poros) is located on the Cape of Foros in the Bulgarian Black Sea city of Burgas. It was first first excavated in 2008 by archaeologists Milen Nikolov (currently Director of the Burgas Regional Museum of History), Dr. Tsonya Drazheva, and Konstantin Gospodinov, after access to its site was denied for decades because of the existence of a nearby military base which has been closed down in recent years. Part of its fortress wall was first discovered in 1989 during the construction of a cow farm. Even though there have been traces of ancient life, the fortress and port city of Burgos (Poros) on the Cape of Foros in Bulgaria’s Burgas is dated back to the Late Antiquity / Late Roman period, with the Bulgarian archaeologists uncovering a large number of buildings, artifacts, and pottery vessels dating back to the 4th-6th century AD. Their excavations have revealed a complex set of fortifications, including walls, ramparts, and towers, which were rebuilt and reorganized multiple times from the 4th until the middle of the 15th century, and were in use throughout this entire period by different states: the Roman Empire, the Byzantine Empire, the Bulgarian Empire, the Ottoman Empire. Some of the more interesting finds including a stone block with an Ancient Roman inscription in Greek mentioning the name of Roman Emperor Gordian III (r. 238-244 AD); a 2nd century AD inscription carved into stone stating that “burgi" (fortifications) were built on the border of the Roman colony of Deultum (located some 10 km inland from the Black Sea coast near today’s town of Debelt) – hence, possibly, the name Burgos; a basilica; the remains of a small monastery called “St. George" which is described in a 13th century Byzantine source; the 6th century lead tube reliquary containing ashes from the grave of John the Apostle in Ephesus, Anatolia.